Posted in Mason Cash, Recipes | Comments Off on Make Our Broccoli Casserole this Christmas! It’s freezing cold in most places north of the equator right now, the kind of weather that makes you want to curl up under a blanket and hide until March. We can think of no better way of heating yourself up a little than with some good old fashioned comfort food! Warm yourself up by making some fantastic baked Macaroni and Cheese in our 11.5 x 8.5 Mason Cash Cane Rectangle Baker (which holds about one and a half quarts). 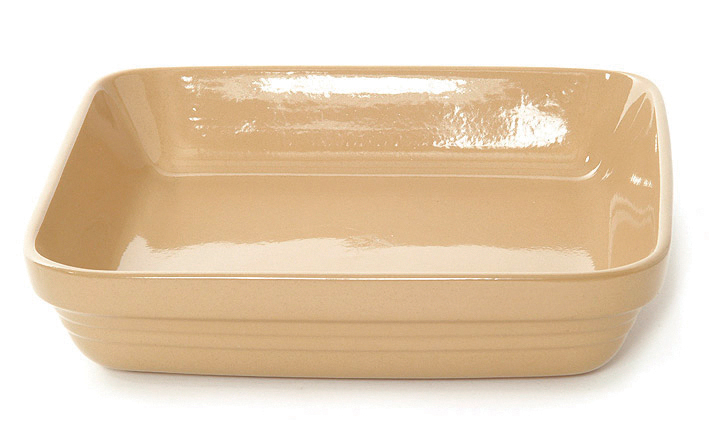 This casserole dish, along with the rest of our Mason Cash Cane Bakeware, is dishwasher, microwave, freezer and even oven safe (up to 400 degrees farenheit). Preheat oven to 350 degrees Farenheit. Bring 6-8 cups of water to a rapid boil, and add salt. We recommend using Kosher salt for this portion, and you shouldn’t add the salt until the water is at a boil so that you avoid damaging your pots. Once the salt is added, your water should somewhat resemble sea water. Add pasta and cook until tender; drain. In a seperate pot, melt your butter and blend in flour, then mix in 2 cups whole milk. Cook over medium-low heat, stirring until ingredients are blended. Add 1/2 teaspoon table salt, pepper to taste, and cheese; stir until cheese is melted. Mix sauce with your pasta, and then transfer to a 1 1/2 quart casserole dish. Bake at 350 degrees for approximately 45 minutes or until bubbly and slightly browned on top. We’re getting down to the wire on Christmas 2010, and while some people have had their holiday shopping squared away for months now, there are still some out there scrambling to find that “perfect gift.” If you’re at a loss as to what you’ll get the pet lover in your life, allow us to point you in the right direction! Some of our very favorite items that we carry are our Eco Pet Mats. If you or your loved ones fancy yourself to be “green,” this is a gift that could be right up your alley. Made from 90% recycled materials, these mats are great for doorways, mud rooms, laundry rooms, and especially underneath your pet’s bowls. The bottom is made from durable non-skid recycled rubber, so you and your pets are sure not to slip or slide on them. Our Eco Mats (short for “Ecology Matters”) are also fade resistant, UV safe, and made right here in the United States. On top of all of their other wonderful features, our Eco Mats are also easy to clean, simply scrub with warm soapy water and dry. Available in six beautiful styles, our Eco Mats retail for $29.95. For more information, head over to our website. Want to treat your animals right this holiday? You can’t forget to slip a little something under the tree for them, and we’ve got just the perfect thing. Our Cane Petware is imported from Mason Cash, a 200 year old English brand. Mason Cash’s Cane Petware has been the ultimate in design and sophistication as far as animal dishes go for the last 70 years, and we’re very excited to offer it to you. Our Cane Petware is made from heavy stoneware in order to ensure durability. Because our bowls are made from ceramic as opposed to plastic, they are bite resistant, as well as heavier so they are increasingly difficult to tip over (meaning less messes for mom and dad). Additionally, the sides of the bowls are thick so they are chip-resistant as well as able to keep food and water cooler for longer. 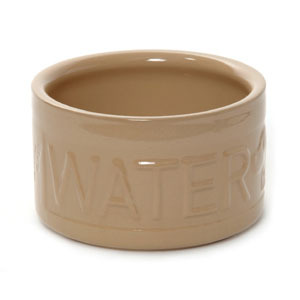 Our Cane Petware contributes to a happier, healthier pet, not just for those who buy it. Mason Cash is happy to donate a percentage of all proceeds to the Royal Society for the Prevention of Cruelty to Animals (or RSPCA). Along with Mason Cash, we at Pacific Merchants feel that all animals deserve to be happy, healthy, and respected, so we’re proud to be a part of this amazing partnership that makes more than $20,000 available every year. To see our selection of Cane Petware (available for nearly any household pet) stop by our Pet Accessories page. If you’re looking for that perfect “little gift” for the animal lover in your life- hoping to show you care without breaking the bank- our cute pet mugs could do just the trick. With eight total designs available, the cat and dog lovers in your life are sure to be spoiled when you give them one of our adorable Price & Kensington pet mugs. The Price & Kensington line dates back to 1896 and is a quality way to show your favorite animal lover you care. Take a peek at our selection here. We hope you’ll spoil your favorite animal lover this year with our unique pet-themed gifts, and from all of us have at Pacific Merchants we wish you the happiest of holidays. Posted in Mason Cash | Comments Off on Make Your own Pesto With Mortar and Pestle! We’re so excited to announce that tomorrow, December 8 2010, Pacific Merchants will be on The Martha Stewart Show! Martha will be showcasing our 12 inch white and cane glazed earthenware Mason Cash mixing bowl, as well as giving a bowl to each member of her studio audience. The show will air live on the Hallmark Channel at 10 a.m. eastern December 8th, with encore airings at 4 and 5 p.m. eastern. Martha Stewart is the quintessential homemaker, often noted for her list of “good things” that she shares with her readers and viewers via her company, Martha Stewart Omnimedia, and their multiple media outlets. Stewart has often displayed Mason Cash bowls on the shelves of her set. We feel that Mason Cash represents a return to fundamentals: kitchen essentials crafted with pride, and meant to last a lifetime, and are immensely pleased to see some of our favorite tools on one of the best home shows around. For more information on Mason Cash‘s beautiful bowls, as well as their many other kitchen tools, visit Pacific Merchants’ website or become our fan on Facebook! Mortar and Pestle sets have long been used to help chefs, gourmands and foodies alike create the recipes of their dreams! Whether creating guacamole for your next fiesta or perhaps the perfect pesto for a night of pasta with friends, a good mortar and pestle has many practical applications in any kitchen. Keeping that in mind, we at Pacific Merchants have looked far and wide for the best mortar and pestle. We scoured every cooking store, trade show, and manufacturer and one day, we finally found it! 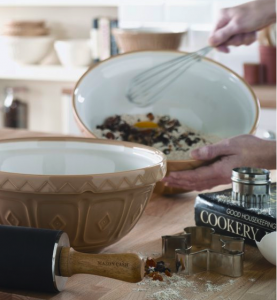 Mason Cash is known for mixing bowls, pudding basins and bakeware… but the real gourmet cook knows that they make the finest (and we do mean THE FINEST) mortar and pestle in the world. Mason Cash’s mortar and pestle were not available in the United States for years, but we at Pacific Merchants knew we had to bring it back to the States one we came across it. Sure, there are a lot of mortar and pestle collectors out there, and perhaps they have a few varieties to their name, but we feel that no collection is complete without a set from Mason Cash. 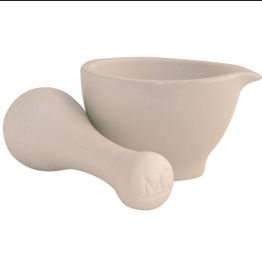 Durable, made of the highest quality stoneware, and including a pouring lip and glazed external finish, the Mason Cash mortar and pestle is perfect to add to your collection.